Has Shelly Modeled Rajkummar As Herself Who Is A First-Time Writer And Director In 'Ek Ladki Ko Dekha Toh Aisa Laga'? Has Shelly Modeled Rajkummar As Herself Who Is A First-Time Writer And Director In ‘Ek Ladki Ko Dekha Toh Aisa Laga’? It is being said that Shelly Chopra Dhar has modeled Rajkummar as herself in the film. The trailer commences with Rajkummar Rao introducing a play named ‘Ek Ladki Ko Dekha Toh Aisa Laga’. Rajkummar Rao’s character’s name is Sahil Mirza who is a theater writer and director. Interestingly that might relate to the first-time writer-director Shelly Chopra Dhar who has helmed the movie of the same name. Ek Ladki Ko Dekha Toh Aisa Laga has been breaking the internet ever since its trailer released. The trailer received praises from critics and audiences alike, who loved how the makers have dealt with the concept. The first look poster was recently launched by Anil Kapoor on the occasion of his 62nd birthday which raised the excitement among the audience as well as in trade. The trailer of the ‘Ek Ladki Ko Dekha Toh Aisa Laga’ will be out tomorrow on 27th December 2018. ‘Ek Ladki Ko Dekha Toh Aisa Laga’ is set to release early this year on 1st February 2018. The film is produced and presented by Vidhu Vinod Chopra associated with Fox Star Studios and directed by Shelly Chopra Dhar. 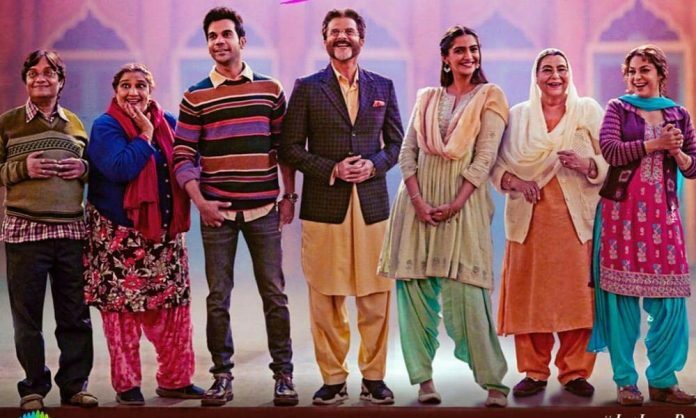 Previous articleAnil Kapoor To Recreate The Magic After 25 Years With Ek Ladki Ko Dekha Toh Aisa, Title Track Out Tomorrow!